Trains at Mombasa Terminus in Miritini (file photo). During a briefing about the status of the multibillion-shilling endeavour at the Chinese embassy in Nairobi on Tuesday, the country's Chargé d'affaires Li Xuhang said the amount would be in form of concessional and hard loans. "We all know that the first phase of SGR from Mombasa to Nairobi cost Sh327 billion and the second phase Sh150 billion. For phase 2B, negotiations between the two governments are on so I will not give any figure at the moment," Mr Mahinga said. However, an inside source said the interim amount is Sh368 billion. "SGR trains move 6,000 people daily, and we are concerned about our operations and security of the equipment," Mr Mahinga said. "The movement of trains from Mombasa to western Kenya needs to be secure from terrorists and other challenges. We ask the Chinese government to support us in this area." "The railway has created more than 50,000 jobs locally and boosted Kenya's economic growth by 1.5 percent," he said during the press briefing attended by officials of SGR management, the National Treasury, Ministry of Transport and Infrastructure and Kenya Railways Corporation. 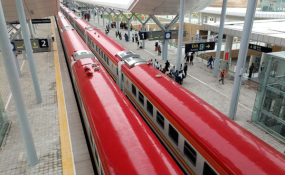 The Chinese said Kenyans form a majority of the SGR managers and employees, and that their safety is guaranteed, "contrary to negative reports in the media". "The Chinese government and people have been reading reports that Kenyans do not support the SGR and the loans. We've also seen reports that the loans are a debt trap and that the Chinese are venturing too much into Kenya," Mr Xuhang said. "We have reached an agreement with the county government of Mombasa to conduct a study along the railway line. We want to talk to the people and get their views and suggestions on how to improve the SGR," the envoy said. "It is important that working conditions are improved to ensure that Kenyans are happy with the immediate and future benefits of SGR. It's important that Kenyans own it. It will be very useful and popular once it reaches Kisumu," he said.